The decision to make the leap to homeownership happens to everyone at a different stage in life. I work with military families every day who are buying a home for the first time. Some are in their late thirties and have teenage children, some are retired from the military, and some are as young as 22. While most homebuyers have families, some savvy young and single servicemembers are making the financial leap (and sacrifice) to homeownership sans family. Are they crazy to buy a home? If you’re considering making that leap, then check out our 8 questions to consider when you’re a young, single servicemember looking to make the leap to homeownership. 1) Are you financially responsible? If you’re terminally late on bills and not entirely sure how much income you earn each month, then let’s make a goal of buying a home in 6 to 12 months after you’ve had an opportunity to develop a good system for staying financially organized before committing several years' worth of your salary (if not more) to one single commodity--a house. To get started on financially responsibility, check out our four tips on getting your financial house in order. Then, make a call to MilitaryByOwner’s partner, Veterans United, who can help you work on credit repair as you work toward your goal of homeownership. 2) Are you prepared to look at your home as a business investment? Your new home is an investment property. Yes, you’ll live in it as a home for the duration of your duty station, but know that at this point in your career, you’re not looking for that forever home (or even that nearly forever home). This means that the kitchen layout doesn’t have to suit exactly what you’re looking for, and it doesn’t need granite when you move in. If granite is going to make a difference in your resale or rental, then by all means save up a couple of thousand dollars to install it before you move, but ask a real estate professional before making that big investment to see if it will yield you a good return. 3) Will your finance officer approve an allotment set-up so that you can just direct deposit into Home Depot or Lowe’s? However, knowing that it’s your own home might make you more motivated to spruce things up a little; after all, you’re no longer stuck with the stark white walls of base housing. Check out some of our many posts on decorating for some ideas on where to get started. 4) Are you willing to invest a little sweat equity in your home? We’ve already established that you’re not likely buying the shiniest, prettiest house at this point, and ideally, you’re not buying the shiniest, prettiest house in your neighborhood, either. In an ideal situation, you’re buying the ugly home that needs some cosmetic work that you’re going to do yourself (or maybe with some buddies that you pay in pizza and beer). It’s not easy work to spruce up a home, but it’s rewarding both physically and financially. When you’re spending your weekends ripping up ugly carpet and installing your own hard laminate flooring, applying fresh coats of paint over jarring, vivid colors, switching out those dated faucets and lighting, and freshening up your landscaping with shrubbery and fresh mulch, you’re building your investment with some hard-earned sweat equity. 5) Are you willing to miss out on some fun? When your friends are gaming or nursing hangovers from that epic night out, are you going to be comfortable with the big decision you made to invest in your future by saving that time and money to work on your home? There will be days where you may not feel so comfortable with that decision; you may want to blow $100 on dinner and drinks, but that’ll put you that much further away from replacing an appliance. 6) Are you willing to give up a little privacy? So, investing in a home isn’t entirely a doom and gloom situation. There’s a lot of gain that can come from your financial responsibility. One option you’ll have as a single servicemember homeowner is the opportunity to rent out rooms in your home. Renting out a room doesn’t come without its own restrictions and drawbacks, which you can read about in our post 4 Concerns When Renting Out a Room in Your Home, but it does come with one huge positive aspect--money for you. Consider adding a private lock to each door, and you may just find that renting out two rooms of your three bedroom abode may cover most of your mortgage, leaving you with a good amount of cash to pretty up the rest of the place. 7) Are you willing to keep six months' worth of mortgage in savings? If your mortgage is $1,000 per month, estimate how long it will take you to put $6,000 into savings. Ideally, create a separate checking account into which you have an auto draft of a certain amount each month depositing prior to your next PCS. If you have a three-year duty tour, for example, and you need to save $6,000, then you would need to have approximately $85 deposited into that account each pay period. It's critical to have this money available for emergencies so that foreclosure doesn't ever become a reality that throws a major wrench in your financially responsible plan. After you PCS and convert that property into a rental (we need to always start from the assumption that we can’t resell our home in just three years), then add the monthly rent you receive from that property into that checking account, and have your mortgage and expenses related to the home managed entirely in that account. By keeping your investment property separate from your personal checking account, you’ll have a much easier time managing the finances of your property. 8) Do you want bonus points? Buy a home within five years of starting service, get a 15-year mortgage, and pay it off before retirement. You can then use the rental income you receive at 20 years as a supplementary form of income or cash in that house by selling it and putting the money toward that forever home you wished you had when you were sacrificing all of those weekends into that first home. 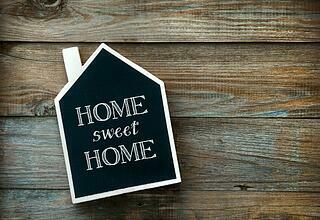 Did you recently PCS or move into a new-to-you home? Click below for some budget-conscious decorating ideas!